The video “Status Anxiety” explains the reasons why so many Americans have negative feelings towards status. Weber defines status as stratification according to principles of consumption of goods and services (lifestyle). First off, most people are envious, it is a natural emotion, and when we see people we consider our “equals” succeeding, it causes anxiety. Succeeding can be anything from getting a job promotion, buying an expensive car, etc. Status is so important to people because it shows where you stand on the social latter. The more you have the more respect you think people will show you. Everyone is always trying to compete and hope to appear a certain way when really they are not like that at all. For example, just because you have an expensive car it does not make you rich, it just shows that you spent all your money on the car so people think you are rich but really you are not. I actually know someone who spent all their money on a beautiful Porsche, and I wondered how someone so young could afford that on their own, but it turns out he blew all his savings on that car just to appear a certain way. It is so sad what lengths people will go to these days. For some reason these materialistic objects make people feel superior to others, which is why other people may get angry, especially when its just to impress other people. In Weber’s theory of The Distribution of Power: Class, Status, Party, he explains that power is the chance a man has to realize their own will in a social action even against the resistance of others. Every man wants power and people feel they must look and act a certain way to achieve that. Weber continues to debate with Marx ideas of class position, however Weber argues about there are different forms of power connected to economic which are: classes, status, and political parties. Weber does not use Marx’s view of the classes but he uses a more difficult view of interest that shape people through their actions and the way society is organize. Weber mentioned that status is a ‘social honor’ or ‘prestige’ of economic power. From what I can understand, the economic power of status is how we are able gain money through our means. An example of a status is having an education degree but not earning a lot of money after getting that degree. But someone who does not have an education degree and gain money through criminal means will have economic power but will not have that status as of an academic person. Weber mentioned that ‘power’ may bring legal order but this is an “additional factor that enhances the chance to hold power or honor; but it cannot always secure them” (Edles & Appelrouth, 193). Even though ‘status’ for different groups of people does not have the same privileges as other groups means that there is some type of stratification in society. Majority of the stratification of status in any society indicated that there are monopolization in society. This society will have stratification within the status of different class of people because the society needs to continue existing by economic means, even if they must exploit the class that is suffering from the hands of the economic stress to exist. “1) a number of people have in common a specific causal component of their life chances…2)this component is represented exclusively of goods and opportunities for income, and 3) is represented under the conditions of the commodity or labor markets” (Ibid, 194). Being a worker and gaining an education at the same time is similar to a status and a class at the same time, in my opinion. However, working and spending my income in things that are necessary must be spending to continue to strive for something better and for future accomplishment (for the future family, or your own life). Weber states that “class situation is…ultimately market situation” (Ibid) which I believe in 2014 United States people (in any class) is actually striving to be in a good economic shape than being in the poor class. Lastly, Weber states that party as a political party not a celebration of party. Weber mentioned that “parties resided in the sphere of power” (Ibid, 200) and their mission is to gain “social power” to influence “social action” no matter what is the ‘social action’. Weber states that parties may present interest of class situation as an individual case. Conversly, the sociological meaning of parties is what kind of social action the party is influenced by (what kind of struggle this social group is being burden with) status being stratified by classes. Edles, Laura and Appelrouth, Scott. 2010. Sociological Theory in the Classical Era: text and readings 2nd edition. Pine Forge Press Sage Publications. Karl Marx writes that money, in essence, defies the natural limits of human capabilities. One’s power is indefinite based on the amount of money they possess. There is nothing that, if offered the right price, one cannot attain. In today’s society, we see this played out in several different ways, large and small. One can achieve their constructed idea of beauty through paying for plastic surgery, implants, lifts, hair removal, etc. If someone wants talent, they can pay for the best couches. If someone wants love, they can buy that too. Marx writes that, “what I am and am capable of is by no means determined by my individuality…I am bad, dishonest, unscrupulous, stupid; but money is honored, and therefore so is its possessor.” (p. 49, col. 2) I think this is why so many people equate money to happiness. Through money, people can become what they are innately not. Or at least that is the illusion that many people “buy” into. Living in a consumer society, it is hard to resist believing the lie myself. We are constantly bombarded with things that will supposedly make us happier, whether it is owning the latest technology or stylish clothing. Money is the most powerful object one can have and that binds society together, encompassing all relationships. The concept of money is crucial to much of Marx’s work, which comes as no surprise given money’s importance within our society. It is as Marx describes it in the Economic and Philosophical Manuscripts of 1884, the ”bond binding me to human life, binding society to me…is not money the bond of all bonds?” In addition to uniting us, money is the great equalizer, and is the “visible divinity” that can mitigate any flaws that we may have. This capability of change is alluring, even more so in today’s image driven culture, but money also has dangerous potential within it. Money and its power, is a social phenomenon; but its centrality to our lives at this point is so entrenched in society that the power that we have bestowed upon it in our attempts to ease commerce, is now the power that it possesses over us. While Marx is undoubtedly aware of the detrimental aspects of money, his language in the “Manuscripts” seems to be a far cry from the biblical “money is the root of all evil,” a sentiment that is prominent in the chorus of N.A.S.A’s song “Money.” While listening to this song, I was reminded of the famous song “Mo’ Money Mo’ Problems” by the late Notorious B.I.G. The choruses of these songs seem to be in agreement about the negative side of money, but while N.A.S.A hits on ideas of the greed and violence that result from the rat race of life, “Mo’ Money Mo’ Problems” discusses the difficulties that can even arise for the person in possession of large sums of money. In looking at the lyrics to Biggy’s song as a comparison to Marx’s theories, the first two verses from Mase and Diddy seem more in line with notions of money as “the great equalizer.” These verses don’t relate to the title’s theme, and mainly serve to flaunt the rappers’ affluence, and their resulting successes in both the rap game and with ladies. Biggy’s verse echoes these ideas, but also talks about how despite his current wealth, he must be ready to fight those who are now breathing down his neck. He’s got “gats in holsters, girls on shoulders,” which interestingly puts his vigilance for a potential battle ahead of his partying antics. He may have money, but he’s far from stress free. Most salient to this point, the chorus states, “I don’t know what they want from me, it’s like the more money we come across, the more problems we see.” Having money paints a target on a person’s back, and this fact, coupled with the actions usually taken in order to amass immense wealth, can lead to a host of predicaments and the creation of many enemies. This idea is made abundantly clear in the imminently ending, and critically acclaimed drama, “Breaking Bad” (apologies for any spoiler alerts, I’ll keep it as vague as possible). After finding out that he has cancer, high school chemistry teacher Walter White begins to cook meth to amass enough money for his family to get by in his absence (this problem is not of the “Mo’ Money Mo’ Problems” variety, but stems from the serious amount of funds needed to keep a family afloat). While Walter is able to make larger sums of money than he ever could have imagined, his problems increase exponentially, and the constant threats of arrest and murder plague him. In dealing with these problems his actions not only toe the lines of legality and ethics, but often cross them. A similar dilemma is presented in the now no longer airing program “Weeds,” which some would argue is a watered down version of “Breaking Bad,” despite airing before it. These shows highlight the tremendously complicated nature of money’s power. 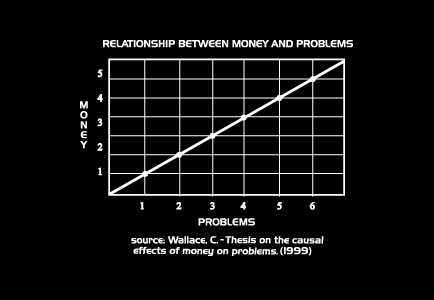 I embedded a video with the lyrics of “Mo’ Money Mo’ Problems,” and included a graph that humorously depicts this relationship on a graph (disclaimer: money as the independent variable should be on the X-axis, and problems should be on the Y-axis). Max Weber was interested in motives behind social action rather than the actual actions themselves. He differs from Durkeim and Marx who sought to uncover universal laws applicable to all societies. Weber was more subjective and thought about people’s mental states or a mentalistic approach. Weber defined sociology as a “science which attempts the interpretive understanding of social action in order thereby to arrive at the causal explanation of its course and effect.” The structure of every legal order directly influences the distribution of power, economic or otherwise, within its respective community. The way we interpret power is the chance of a man or number of men to recognize their own will in social action even against the resistance of others who participate in the action. The emergence of economic power can be a consequence of power that exists on other grounds. Power must be valued for its own sake. However, not all power involves social honor. Weber talks about traditional action (actions controlled by tradition or deeply rooted habits) affective action (conditions determined by emotions and affections) value-rational action (actions determined by conscious belief in the inherent-ethical, esthetic religious etc.) and instrumental action (carried out to achieve a certain goal). People use class as a self-identification or to see where they fit. It’s a “subjective class identification” process. Classes, status groups and parties are phenomena of the distribution of power within a community. Class doesn’t simply relate to the means of production. Class refers broadly to the market situation. 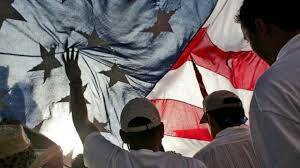 The relationship between race and social status is variable. Physical labor generally disqualifies one from membership in the most privileged status group. Economic pursuits are seen as a debasement of status. As far as parties go, parties reside in the “spheres of power.” Party-oriented social action always involves an association directed towards an end or a goal striven for in a well executed planned manner. The goal could be the cause or personal. Parties aren’t solely based on purely class or status.